An energetic species that has three different color morphs. Although typically red and black, this species may also be yellow and black or orange and black. J. haematoloma adult in Davis, California. Photo by C. Perreira. J. haematoloma has been found in several states (CO, KS, MO, OK, TX, AK, MS, TN, LA, GA, FL, SC, NC, and VA), Cuba, the Bahamas, Puerto Rico, the Dominican Republic, Jamaica, Guatemala, Honduras, Nicaragua, Costa Rica, Panama, Colombia, and Venezuela but the exact locations of where it was collected are not known. Aldrich, J.R., Carroll, S.P., Lusby, W.R., et al. (1990) Sapindaceae, cyanolipids, and bugs. Journal of Chemical Ecology, 16, 199-210. Carroll, SP & Loye, J.E. (1987): Specialization of Jadera species (Hemiptera: Rhopalidae) on the seeds of Sapindaceae (Sapindales), and coevolutionary responses of defense and attack. Ann. Entomol. Soc. Am. 80: 373-378. Carroll, S.P. (1988) Contrasts in reproductive ecology between temperate and tropical populations of Jadera haematoloma, a mate-guarding Hemipteran (Rhopalidae). Entomological Society of America, 81, 54-63. Carroll, S.P. (1991) The adaptive significance of mate guarding in the soapberry bug, Jadera haematoloma (Hemiptera: Rhopalidae). Journal of Insect Behavior, 4, 509-530. Carroll, S.P. & Boyd, C. (1992) Host race radiation in the soapberry bug: natural history with the history. Evolution, 46, 1052-1069. Carroll, S.P. (1993) Divergence in male mating tactics between two populations of the soapberry bug: I. Guarding versus nonguarding. Behavioral Ecology, 4, 156-164. Carroll, S.P. & Corneli, P.S. (1995) Divergence in male mating tactics between two populations of the soapberry bug: II. Genetic change and the evolution of a plastic reaction norm in a variable social environment. Behavioral Ecology, 6, 46-56. Carroll, S.P. & Salamon, M.H. (1995) Variation in sexual selection on male body size within and between populations of the soapberry bug. Animal Behavior, 50, 1463-1474. Carroll, S.P., Klassen, S.P. & Dingle, H (1998) Rapidly evolving adaptations to host ecology and nutrition in the soapberry bug. Evolution and Ecology, 12, 955-968. Carroll SP, Marler M, Winchell R, et al. (2003) Evolution of cryptic flight morph and life history differences during host race radiation in soapberry bug Jadera haematoloma. Entomological Society of America, 3, 135-143. Hoffman, R.L. and Steiner, W.E. 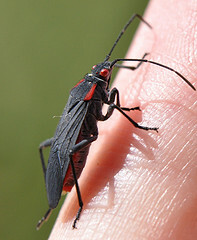 (2005): Jadera haematoloma, another insect on its way north (Heteroptera: Rhopalidae). Banisteria, 26,7-10. McLennan, L.A., Lake, F.K., Carroll, S.P., et al. (1994) Genetic model for color polymorphism in Jadera haematoloma (Hemiptera: Rhopalidae). Entmomological Society of America, 87, 936-940.